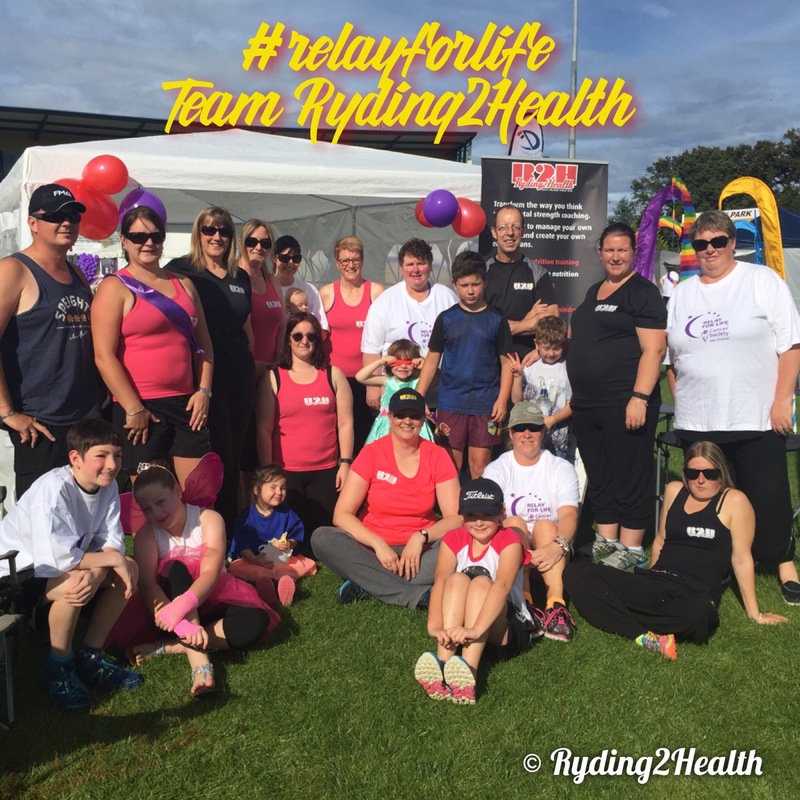 When I decided to put it out there a few months ago about entering a team Ryding2Health into this years Relay for life, I had no idea what to expect, and I certainly didn’t expect the outcome that we got. Here is an account of our weekend, including a recording of the most poignant ceremony of the night and a video of our fun filled fund raising activities! I lost my mother really suddenly to cancer in 2013, just a few weeks after I emigrated to New Zealand. At the time I said I wanted to do something to raise money for cancer research. I played with a few ideas, including some type of endurance fitness event, to parachute jumps and all sorts of things. Nothing ever really came to fruition. The idea sat in the back of my brain for a few more years. Then I suggested Relay for life to some of my clients. 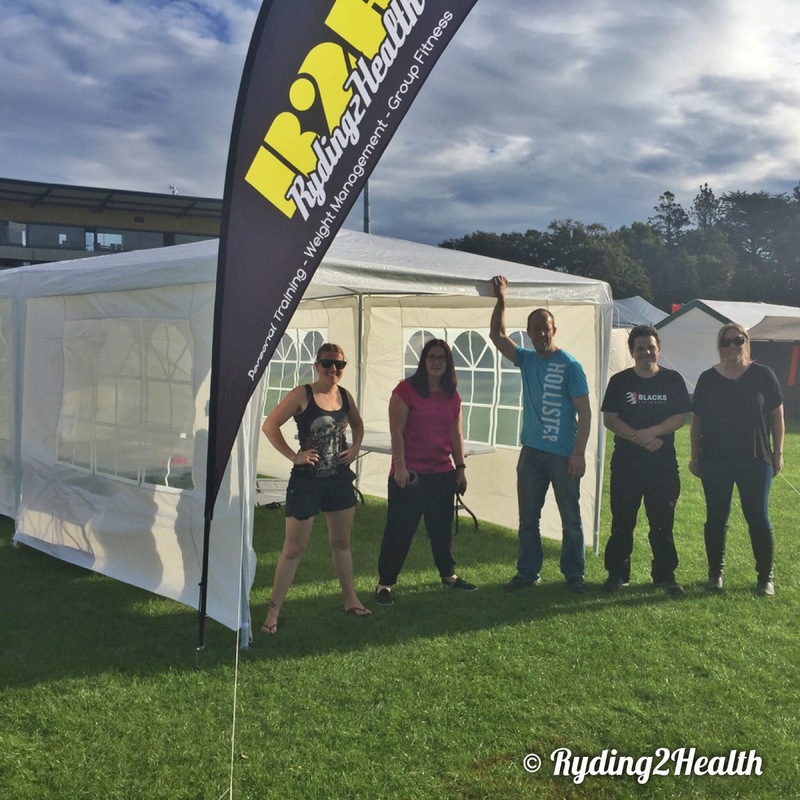 It was a slow take up at first, but in true Southland style, once I had committed to the event and entered a team (donating the first $100 myself from Ryding2Health) That set the ball rolling for what was to be a life changing weekend. We had two cancer survivors within our team too, which made this event all the more special for us. You would expect team Ryding2Health to be the healthiest team out there, being the only fitness based business to have a team in. Well, I can tell you that team Ryding2Health are great bakers, not necessarily in a healthy way but man it all tasted good! We scheduled our walking so that someone was walking with our baton all the time, throughout the 22 hour event, with me posting photos and updates throughout the event. Not all teams took this approach so we were met with some wow type feedback, many of our supporters families not knowing that it was an event that went throughout the night too. I went to the studio on Saturday morning to take the two regular classes, then rushed to a team leaders meeting at Rugby Park at 10:30am then stayed there till the following Sunday lunchtime. 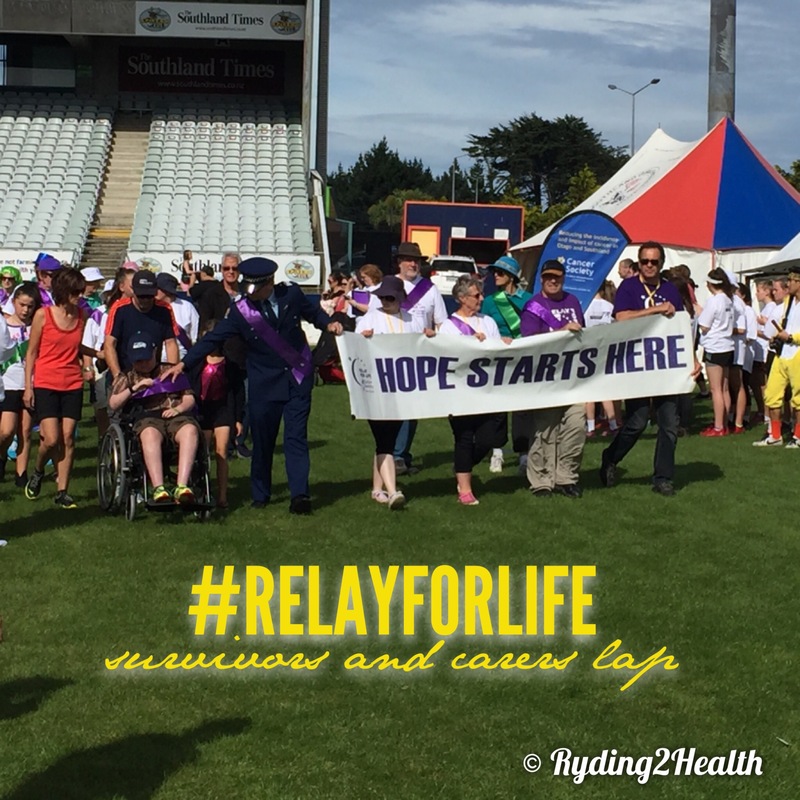 The event started with an opening ceremony then the survivors and carers lap of honour. Very emotional start to the weekend. At the front of the lap is a policeman who later presented a very emotional speech at the candlelight ceremony, and his 10 year old friend (in the wheelchair) who both met during Chemotherapy. Unfortunately his young friend was too unwell to deliver his speech, so they used a pre prepared recording. We decided to spice our walk up a little, well, walking in a circle can be repetitive! So we decided to have a board out front with an exercise to do each time they passed out site. Our team started this off, soon taken up by lost of other walkers as they passed! Yes I was tired, yes I felt rough, (as did a lot of the team for a couple of days afterwards). This however does not compare at all to how it must feel to be faced with cancer, so our short term discomfort was definitely worth it. We raised an amazing $1612. This far outstripped any expectations that I had for our fundraising. This was done through incredible team work, many members persuading family friends and work colleagues to donate. We had many skilled bakers and artists in the team too: our sell it on the day stall included jewellery, pillows, biscuits and cakes as well as some lollies donated to us by one of our team members who owns a shop. All in all we raised around $500 just during the Saturday – Sunday event alone! I am so so proud of team Ryding2Health and I am sure all our lost friends and family who were taken by cancer would be too. The most difficult time for me was the candlelight ceremony where we lit candles to remember those we have lost, with some very moving speeches and readings. Here is a recording of the ceremony, including the very moving speech recorded by the ‘Chaemo Crazies’ ! It was a wonderfully emotional, uplifting, energising and meaningful weekend. Our entire team made me proud, we are already talking about the next event in 2018! For you, Mum, Kellie Forbes, all those who are still battling cancer and all those were taken from us far too soon.